Our impact can be measured by the number of young people we help against the dollars you donate. Another powerful measure is a single story from one person whose life has been forever changed by your support. Below are a few stories of life change in Kenya. No one can get through this life alone. We all need people who will help us, especially as young adults. Find out how you are changing the lives of Faith and Mary. How two young men became friends through Two Feet Project and how that friendship would impact both their lives immensely. 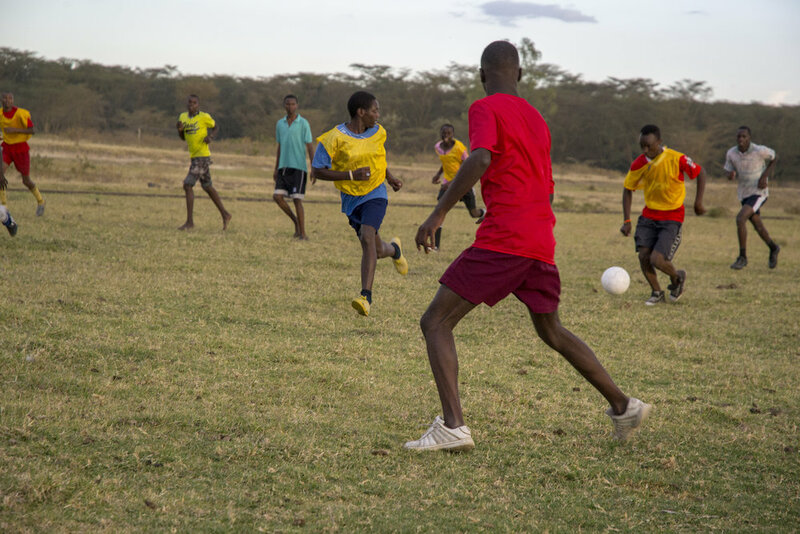 His past life, his love for futbol, and his dream for the future - hear Bonke tell his story. Kevin received his first loan and completely paid it off within a year. Today, he is in the midst of paying off his second loan while traveling around the country to purchase fish, which he then dries and sells to animal feed companies. One of the main reasons Kevin wanted to start his own business was that he wanted to be in a position to hire marginalized youth and help provide a living for them within his business. His goal is to continue to grow his company so he is able to hire even more marginalized youth soon. But Kevin’s desire to give back doesn’t end there. He continues to attend meetings for youth looking to acquire a future loan through Two Feet Project. He shares his insight and experiences with them, to help them avoid the mistakes that he made. Kevin was given a chance by people like you. His desire to help others was fueled by your desire to help him. He is strengthening his community and his hard work is paying off because someone like you provided an opportunity. You can call me ‘C’, I’m 13 years old. I come from Rhonda estate, a neighborhood of Nakuru. People call my neighborhood a ghetto, I call it home. I’m the product of a single mother, in a family of seven. Without supervision one has a lot of free time, and free time is a dangerous thing when you’re a teenager living in the ghetto. My mom would leave early in the morning for work and be gone till late. I found community with other girls in the neighborhood. In an impoverished area it’s nice to have people who can relate, even if they are a bad influence. I started to do whatever it took to find acceptance with others in the neighborhood. Peer pressure can have a strong influence on someone. Oftentimes I would steal things from my mom’s house because I didn’t want to disappoint the girls in the gang. They asked me to, I obliged. I became sexually active before the age of 13, no one was around to tell me otherwise. Guys wanted to, I obliged. But my story doesn’t end there. I have a grandmother that loves me a lot and when she discovered what was taking place, she connected me with Faith at Two Feet Project. At first, I wasn’t interested in talking, but over time I started to open up. I’ve found a safe place to talk about my feelings within Two Feet Project. I’ve even moved in with my grandmother to be around positive supervision. There are still a lot of times where the pull of the streets and my past life come back, but I lean heavily on my grandmother, my mentor (Faith), and my teammates at Two Feet Project. I’m working hard to make sure I don’t go back to where I started. I believe I will make it because I am valued, even if the streets say otherwise. Brian Otieno is leaving TFP… and that’s a VERY good thing! Two Feet Project has always been an organization that meets the needs of youth, wherever they are, and helps prepare them for life as an adult; a contributing member of society. So when we first started working with youth in 2011, we understood that in order to achieve sustainable change, we would have to be prepared for the long haul. We could not rush or put a time limit on youth development. We decided to care about the individual first, and let the results come no matter how long it took. Over the last couple of years, we have started to see young men and women transition into the next stage of life, without the need for Two Feet Project. And while all youth will always be a part of the TFP family, no matter how long they are involved with the organization, we celebrate the occasion when the need for TFP is no longer a daily necessity. Today is one of those days as one of our youth, Brian Otieno, is moving on. We’re excited to see the impact he has on the country of Kenya. We’re proud of the man he has become, and excited to see the lives that will change because of who he is. Brian took a minute to express his gratitude to TFP and the coaches that played such an important role in his life. You can join us in our work to support underrepresented youth in Kenya.